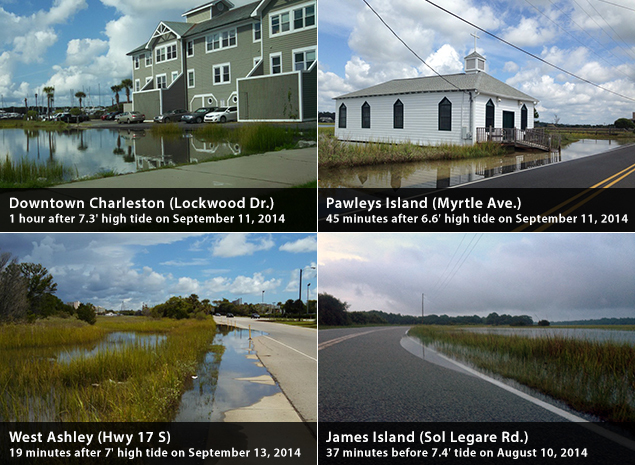 Highest Predicted King Tides – Coming This Fall | Live Healthy S.C. The highest predicted King Tides of 2015 are quickly approaching! At Charleston Harbor, water levels are expected to reach 7 feet and higher above Mean Lower Low Water (MLLW) at the end of September and October. These extreme high tides are predicted to occur during the peak of the Atlantic Hurricane Season. NOAA’s tide predictions are based on the astronomical tide calendar, which takes into account the gravitational pull of the moon and sun on Earth’s oceans. Keep in mind that water levels can exceed predicted heights under various meteorological conditions like onshore winds, low atmospheric pressure, and precipitation. In 2014, observed King Tide water levels often surpassed astronomical predictions at Charleston Harbor. For instance, there were over 3.5 times more King Tide days than predicted. Cumulatively, water levels were 6.6 feet MLLW or higher for t otal of 201 hours, over 5 times longer than predicted. On average, observed King Tides were 0.6 feet higher than astronomical predictions, with a maximum observed difference of nearly 2 feet above predicted levels. King Tides peaked just below 7 feet, on average, and the highest observed water level reached 7.6 feet (August 9). 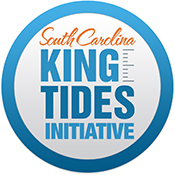 The MyCoast: South Carolina King Tides Reporting Tool is revealing what King Tides look like on the South Carolina coast and how these events affect infrastructure, mobility, and our shared natural resources. Over 180 photos were submitted by MyCoast members last year, see photos from select reports below. Visit http://mycoast.org/sc or download the MyCoast app and start photo-documenting these extreme tide events using your smartphone! This entry was posted in Ocean and Coastal Resource Management, Uncategorized and tagged King Tides, MyCoast on August 14, 2015 by SC DHEC. This is an interesting article, but for those of us without the background, it loses a lot by not adding a few short explanations. Thank you so much for the feedback. We will work to tone down some of the technical talk and really appreciate you pointing this out.